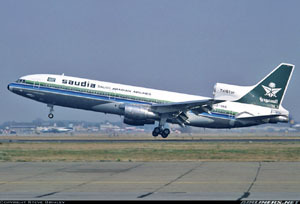 On August 19, 1980, Saudi Arabian Airlines Flight 163, L1011 registration number HZ-AHK, took off from the airport at Riyadh, Saudi Arabia. Seven minutes after take-off an aural warning indicated smoke in the aft cargo compartment. In response to information received from the flight attendants, the flight engineer went into the passenger cabin and reported back that there was fire and smoke emanating from the extreme aft area of the cabin, directly above the C-3 cargo compartment. The captain decided to return to Riyadh. During the return flight, the flight attendants attempted to fight the fire, which had burned through the cabin floor, with available handheld extinguishers. The aircraft landed back at Riyadh some 20 minutes later, and did not make an emergency stop, but instead taxied off the runway to a taxiway. It was several minutes after stopping the airplane on the taxiway before the engines were shut down. Following the landing, and prior to initiation of an evacuation, all of the occupants were incapacitated by the smoke and fire inside the airplane. An evacuation was never initiated. All 301 passengers and crew perished in the fire.